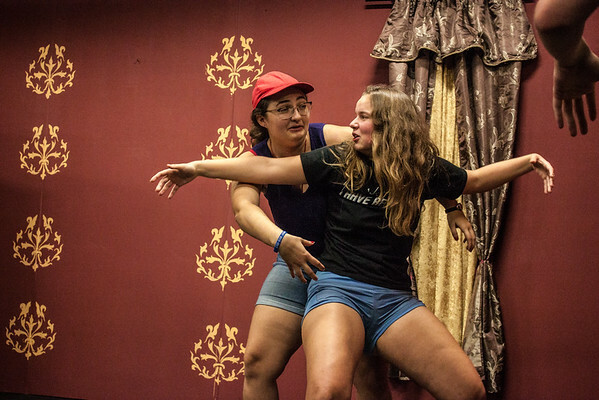 A group of New College students will pack warm clothes and their sharp wit to compete in the 10th College Improv Tournament National Championships, in Chicago in February. The Comedy Friends! club earned the right to compete by winning a regional tournament Nov. 19 held at Florida Studio Theatre in Sarasota. The Friends! went head-to-head with eight other university teams from Florida. To make sure each of the 12 performers got stage time, the Friends! split into two teams for the regional tournament. The two teams wound up competing against each other in the finals, “which was the greatest thing in the world,” Abrams said. Amy Bernard and Juliana Lind take their turn on stage during a recent Comedy Friends! rehearsal. The group practices twice a week during the school year and performs, on average, three to four times a semester, including a show this fall during Parents Weekend as they prepared for the regional tournament. 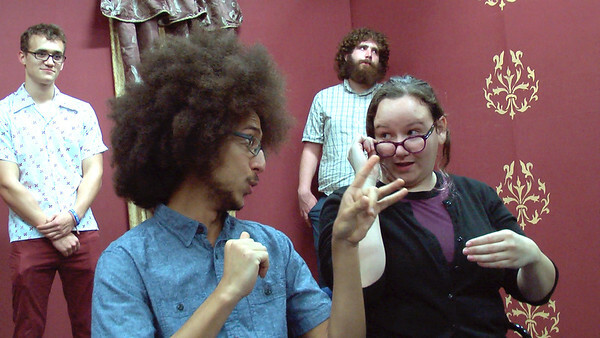 Andrew Maldonado and Francesca Tignor, foreground, play newscasters during an improv scene, as James von Hollen and Chandler Honaman look on. As the semester draws to a close, the group is figuring out what to expect in Chicago. “Cold weather,” Abrams deadpanned. “We’ll definitely do the best we can,” Gray said. “We’ll have to practice a lot more,” Abrams added. The national tournament will have the same format as the regionals. Each team gets 20-22 minutes to perform any style of improv they like, such as short-form games, long-form scenes, or a mix. Gray and Abrams agreed they’ll probably stick with a long-form show — a series of 3- to-5-minute scenes inspired by a single suggestion. The characters the performers create drive the scene as it plays out. “It’s (long-form) the one where we know we’re the best at,” Abrams said. Besides Abrams and Gray, the troupe members are Zach Conn, Francesca Tignor, Amy Bernard, Qake Cooley, Alice Leavengood, James von Hollen, Andrew Maldonado, Chandler Honaman, Juliana Lind and Robert Lawlor. The Comedy Friends! has secured partial funding for transportation and lodging for the trip from the New College Student Alliance. The group is also considering a fundraiser performance. The 10th College Improv Tournament National Championships will be held Feb. 25 in Chicago at the Vittum Theater.